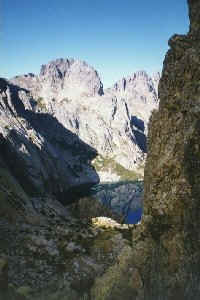 The second highest top in Corsica, it is accessed from various sides. This is the northern view from Bergeries de Cappellaccia. Snow will stay well into summer above 2000 m. Special equipment is not required on marked tracks. The 1600 m ascent from the valley is quite strenuous, one of the highlights is the pretty Lavu di l'Oriente. The picture below was taken in mid-autumn. A few hundred meters below the summit of Monte Ritondu is the charming Lavu Bellebone, encased in a dramatic cirque. This was in early June. The same lake in early autumn has a very different atmosphere and light. 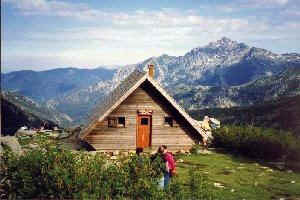 Down from Monte Ritondu this hut is a comfortable overnight stop. 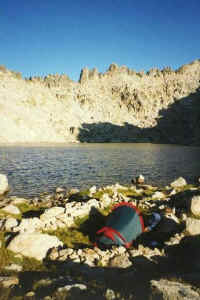 It is on the GR20, that goes further towards Monte d'Oru, in the background. 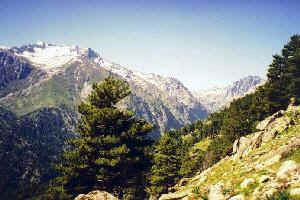 A way to return to the valley is to follow the GR20 for a couple of hours up to a dent in the jagged crest. 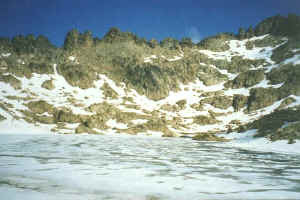 Below are Capitellu and Melu lakes on the way out to the popular Restonica valley, snack-bar and car park.